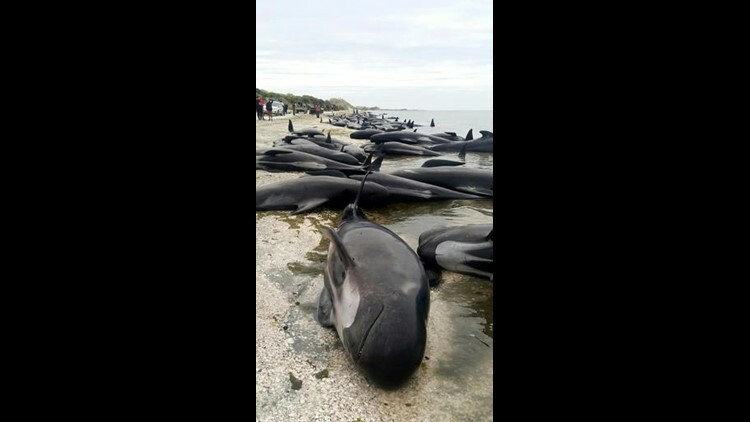 WELLINGTON, New Zealand (AP) — It was the sound of soft sighs and cries in the half-light that first struck Cheree Morrison, and then as the dawn broke she began to see the extent of the carnage — more than 400 whales had swum aground along a remote New Zealand beach. About 275 of the pilot whales were already dead when Morrison and two colleagues found them Friday on Farewell Spit at the tip of the South Island. Within hours, hundreds of farmers, tourists and teenagers were racing to keep the surviving 140 or so whales alive in one of the worst whale strandings in the nation's history. Morrison, a magazine writer and editor, stumbled upon the whales after taking a pre-dawn trip with a photographer and a guide to capture the red glow of the sunrise. "You could hear the sounds of splashing, of blowholes being cleared, of sighing," she said. "The young ones were the worst. Crying is the only way to describe it." The adult and baby whale carcasses were strewn three or four deep in places for hundreds of yards, often rolled over on the sand with their tail fins still aloft. Morrison's group alerted authorities, and volunteers soon began arriving in wetsuits and carrying buckets. Dressed in her jeans and sandshoes, Morrison waded into the water and did what she could to try to maneuver the surviving whales upright so they could breathe more easily. "I walked away crying my eyes out," she said. "We knew there were limited things we could do." Volunteer rescue group Project Jonah said a total of 416 whales had stranded. 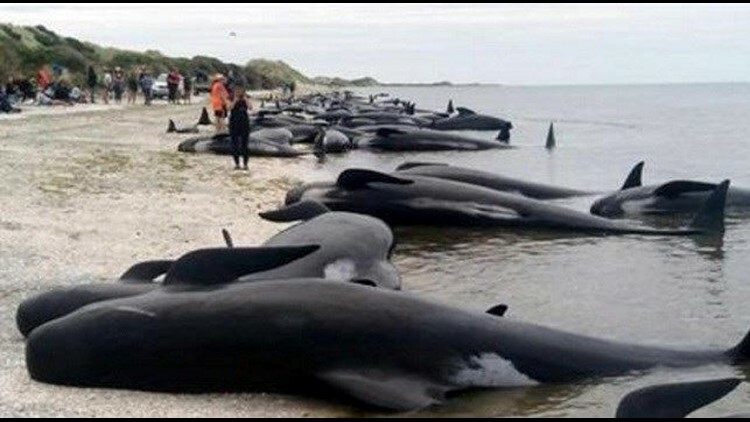 When high tide came, volunteers managed to refloat about 50 the surviving whales while the other 80 or 90 remained beached. The volunteers then formed a human chain in the water to try to stop the creatures from swimming back and stranding themselves again. It will likely take a day or so to determine how successful their efforts have been. Volunteers plan to refloat more whales on Saturday. Farewell Spit, a sliver of sand that arches like a hook into the Tasman Sea, seems to confuse whales and has been the site of previous mass strandings. The Department of Conservation said about 500 volunteers had joined conservation workers on the beach. Community ranger Kath Inwood said the volunteers were continuing to keep the stranded survivors damp and cool by placing blankets over them and dousing them with buckets of water. The high tide allowed volunteers their one shot of the day to help some of the whales. Many plan to return for the high tide on Saturday to try to refloat more of the whales, including any that strand themselves again. There are different theories as to why whales strand themselves, from them chasing prey too far inshore to them trying to protect a sick member of the group. Inwood said whale strandings occur most years at Farewell Spit, but the scale of this event came as a shock. Sometimes described as a whale trap, the spit's long coastline and gently sloping beaches seem to make it difficult for whales to navigate away from once they get close. The beach is remote. Getting there from the nearest provincial airport in Nelson takes a three-hour drive followed by a 15-minute hike. Conservation workers said many of the surviving whales were likely to be in bad shape given the number of deaths, and that their conditions would likely deteriorate the longer they remained stranded. New Zealand has one of the highest rates of whale strandings in the world, and Friday's event is the nation's third-biggest recorded stranding. The largest was in 1918, when about 1,000 pilot whales came ashore on the Chatham Islands. In 1985 about 450 whales stranded in Auckland. "It was just heartbreaking," Morrison said. "Utterly heartbreaking."